Alexander Rose Portofino Rectangular Dining Set:This Alexander Rose Portofino Rectangular Dining Set features a rectangular, a parasol hole and six armchairs, in a choice of two fabrics. The Alexander Rose Portofino Rectangular Dining Set has been made from steel for a sturdy place to dine upon and the wire mesh allows air to flow through, keeping all the surfaces cool. 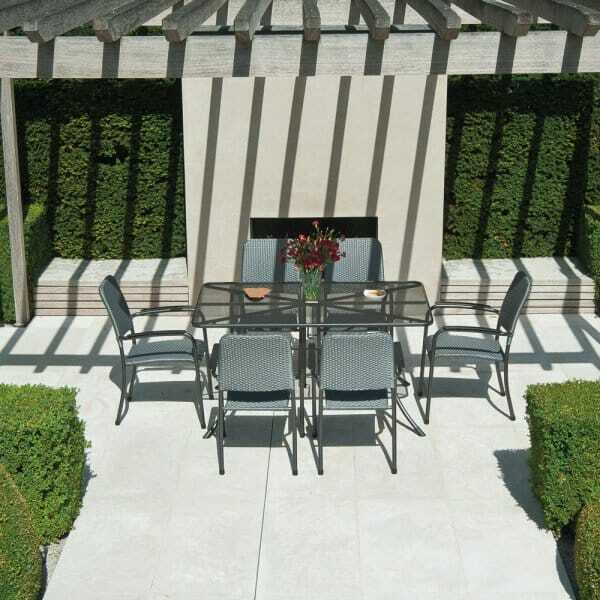 The Alexander Rose Portofino Rectangular Dining Set has been powder coated to prevent corrosion and this also offers protection against weather elements and will give you with many years’ worth of use. The chairs to the Alexander Rose Portofino Rectangular Dining Set have armrests to offer support and comfort and the table has a parasol hole so you can provide shade to your guests. NB: Images shows chair with cushion, This is for illustrative purposes and does not come with the chair.